Click HERE to view my tablescape post. Hope you like the pink flowers in the centerpiece and the pink pattern in the oriental rug! Make sure to stop by and visit one of my very favorite people in all of Blogland, Susan of Between Naps on the Porch. 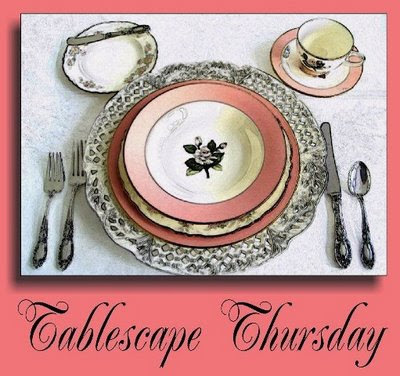 If you haven't seen her fantastic tablescapes, you've missed an amazing treat! If you'd like to leave a comment, or have a question, please leave it at the end of the original post HERE. Thank you and Happy Pink Saturday! Good morning Bill. I am really honoured that you mentioned my blog in your beautiful blog. 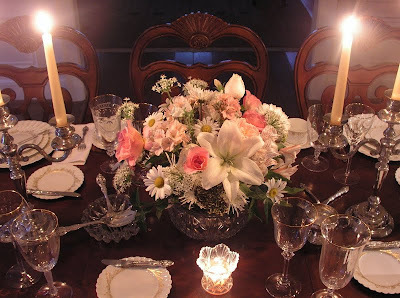 Thank you so much.I have told you already how much I loved your tablescape and I have been back several times to look again.I love the pink flowers in the centerpiece and I had noticed your beautiful rug too. You are right about my love for classic American films. I still have about 150 moviestar pictures I all bought when I was a young girl. 75 are of Doris Day.I have posted some collages in former posts. Will post some more in the future. Bill, you have a standing invitation to come to our house ANY TIME and arrange flowers and of course visit and eat takeout (I hate to cook)! These are exquisite. GREAT job! Another wonderful job. We head back to Florida in about 6 weeks. All my table setting stuff is there and I am anxious to try your photography tips! L♥ve your pink goodies this week. Just when I think I have enough pink in my life I participate in Pink Saturday and see even more sweet things I’d enjoy having in my home or flowers for my gardens or just to look at☺ What could be better than the color pink dancing in your head all morning? Thanks so much for sharing. Hoping your weekend is filled with sunshine and the comfort of those you love and who love you. I love the pink roses on your elegant table setting. Your photographs always look so lovely. I have visited Riet too and her blog is beautiful and I enjoyed seeing the fabulous pink flowers in her friends garden. You have a Lovely Pink Post Bill !! The very first thing I noticed was the glowing candles with the beautiful flowers in the middle.I noticed the candles first,because they set off a certain glow, like twinkeling stars.The centerpiece is just so beautiful.As for your mismatched dishes,The whole tablescape is drop dead gorgeous.Its all very proper to do this.I've done it with old stone ware dishes I got from a dollar store.Very chic.I think you are the master of the tablescapes though.I really do!!! Your Chandelier is stunning for sure. You know how I love to make the upside down Xmas trees...its because I love the chandelier look. Bill...I am having a give away please stop by so I can throw your name in the hat. Bill, your tablescape is absolutely enchanting. And, the touches of pink are perfect. It's good to see you for Pink Saturday. We all like it when you're "in the pink". This is a fabulous table setting. I love the pinks Saturday theme, it just look so adorable. Fabulous post, the pinks are simply pretty! Of course, I had to start at the most recent post to get to last Pink Saturday! What an absolute delight!!! Thank you so much for taking time to photograph and share the lovely pictures and stories of those homes. Still visiting around for PS. See you again soon. I love your pink posts...well, like all you do Bill. I have a request though...can you please make a table scape for Thanksgiving, all in fall colours, I would love to follow it for my Thanksgiving lunch or dinner. Thank you. Bill can you please show me or make some Thanksgiving tablescapes so I can follow for my Thanksgiving. Thank you in advance. Love.